A couple of weeks back, Square Enix finally gave Final Fantasy 14 Bards the ability to play real music. Now YouTube is filling with great (and only occasionally terrible) Bard performances. Since Square Enix's has users agree to not use the new Bard tools to recreate third-party music, most of the tunes showing up online are standard Final Fantasy fare. Here we see Solaris White plucking out the Chocobo theme with an appropriate companion. While most Bards are starting off simple, recreating easy tunes with a single voice, others are taking things to the next level, recording multiple tracks and splicing them together. MintormentGaming's version of "Matoya's Cave" is just gorgeous. Some Bard players, not content with being limited to the harp, utilise other in-game sound effects in their compositions. 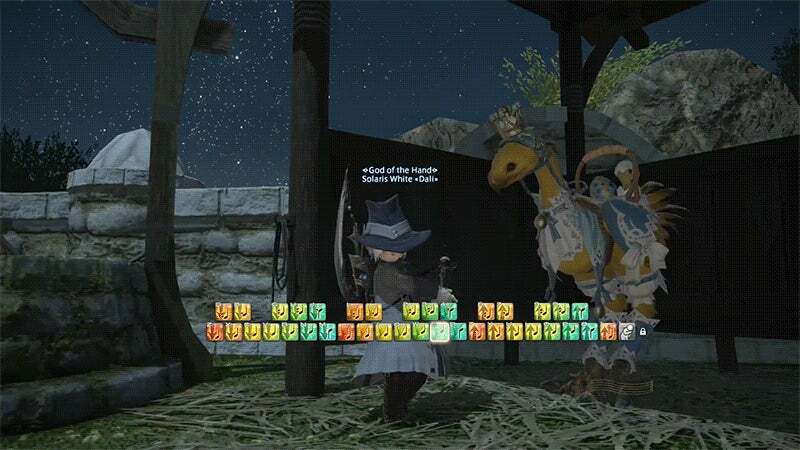 In an early attempt at multi-screen performance, Windy FFXIV uses hotbar switching noises as percussion while performing the game's Alexander boss fight theme. Even more impressive, the performance is done using gamepad controls instead of keyboard. One of the most impressive Bards on YouTube so far is ADZDarkStone, whose multi-track performances are breathtaking. Here is "Battle on the Big Bridge". Many of the more complex Bard melodies are being created using macros, pre-programmed instructions that hit the right note with the right timing. ADZDarkStone doesn't do this, as demonstrated in his performance of "The Decisive Battle". It's great to see the tools being used to recreate some beautiful music. I was worried that, in the wrong hands, the feature would be used for evil. I love this feature. I've already learned the Victory theme, Prelude theme, Epic Sax and Baby Elephant Walk. I just need to learn how to make a keyboard macro to automatically play them now! I didn't know what the last one was until I opened the link, and it still sounds nothing like it. Honestly maybe 2 of the videos are decent and the rest sound worse than the 8 year old who busk in the mall with her violin.